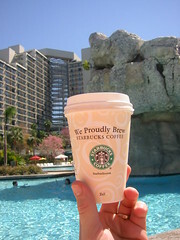 I don't know what it is, but drinking coffee in Florida is a lot different than it is in Seattle. Lattes never taste quite right here. I'm not sure if its the weather, or the fact that they just make them better in Seattle, but I end up swiching to regular coffee every time I come here.